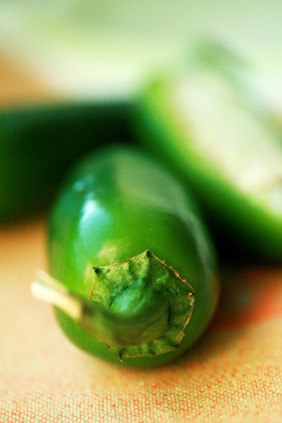 Jalapeños also known as the “fat chili” or chili gordo, hails from the Mexican town Jalapa. Jalapeños can range from mild to hot, making them a good “starter chili” for those who want add more liveliness to their dishes, but are newbies to fiery capsaicin. Ranking lower on the scoville scale compared to other Mexican chilies, they deliver the same grassy, herbal flavor notes as mild green bell peppers but with more bite. Most local groceries carry jalapeños in the produce isle where you’ll find red, yellow, and green bell pepper. Look for peppers with firm, unblemished skin, deep green if you like the flavor of bell pepper or ones streaked with red if you prefer a sweeter taste. The heat from jalapeños lies in the seeds and white membranes that attach the seeds to the inner wall of the chili. Simply scoop them out with a serrated edged spoon or slice them off with a pairing knife to enjoy a more mild crunch. Jalapeños and cilantro are a dream team and make a wonderful base for soups, stews, and dips, including guacamole. Add chopped fresh jalapeños to dress up chicken, tuna, and egg salad. Make your own peppery cheese mix by adding chopped jalapeños to shredded Jack, Colby, or Muenster cheese. Healthy Jalapeno Popper recipe please and thank you!